Part of what is so annoying to people about philosophy, in my opinion, is that all philosophers ever want to talk about is the proper definitions of things. That isn’t to say that there’s no such thing as applied philosophy, which is perhaps appropriate, because metaphysics, at its core, is about the study of things. Not things. Things. Philosophers have different ways of expressing this – the thing-in-itself, noumena, forms – remember Plato’s allegory of the cave? 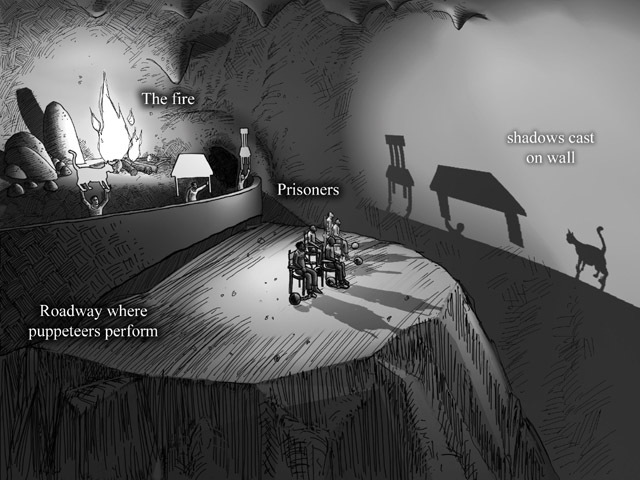 The idea is that we are the prisoners in the cave watching the shadows, and metaphysics is our attempt to figure out what the hell is going on outside. What counts as ‘real’? What doesn’t? What kinds of things are there? Westworld, the Matrix, Inception, that one episode of Black Mirror… there are COUNTLESS examples in pop culture of fiction we create around essentially metaphysical questions. There’s a reason she repeats this question so many times – it’s because the entire project of Westworld‘s mythology is to put into relief our thoughts and feelings about our own reality, about the unexplored regions of our own metaphysics. What is “real” and how should the reality or unreality of the objects of our awareness affect our behavior towards them? What is the “true nature” of reality – the “base level” of the simulation – this is the primary question of metaphysics, except it’s referred to as “the problem of the first cause,” meaning that in order to answer the question of why there is anything at all, we need to answer the question of the origin of reality. The two most common answers to this, of course, are God and the Big Bang. But both of these answers, from a metaphysician’s point of view, are unsatisfactory. If God created the Universe, the metaphysician would want to know, who created God? And if something other than God created God, should we not then call that God? This is called the problem of “infinite regress,” since like the child who won’t stop asking the “neverending why,” this answer forces one into a chain of Gods creating Gods, which simply can’t tell us anything about the first or primary cause. So, why not just satisfy ourselves with a scientific answer, like the Big Bang? Because, all that the theory of the Big Bang really tells us is that everything that exists came from an infinitely dense speck of dust – not why that infinitely dense something existed to begin with, which is what the metaphysician wants to know. Metaphysics, then, tries to figure out what, if anything, could be said to be the source of reality – is it a simulation, perhaps? Are we, as Descartes proposes, being deceived by our senses to believe in a reality which in truth, eludes us? What light might relativity or quantum theory shed on the question of a primary cause, if any? Salvador Dali’s “Persistence of Memory” explores metaphysical ideas like time, space, reality & unreality. Why are there rational beings? Is there one world, or many? For now, that’s a start, but metaphysics covers an enormous amount of territory in philosophy, so there’s always more to learn.